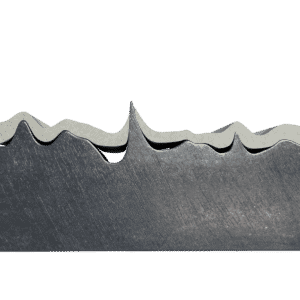 As EonCoat is spray-applied onto carbon steel, the acid in EonCoat converts the top layer of steel into an inert iron magnesium phosphate so that the steel can no longer corrode. This is the first line of defense EonCoat delivers. When this alloy layer is viewed through an electron microscope, it shows a thickness of 2 microns. Clearly visible in the electron microscopy is the chemical bond that results from the steel coming into contact with the patented acid formula in EonCoat. The resulting alloy is a permanent protective layer against corrosion. The second layer of protection delivered by EonCoat is a 20 mil thick ceramic shield that serves as a phosphate reservoir to continuously re-phosphate the steel to insure that the alloy layer remains intact. This ceramic layer is chemically bonded to the iron phosphate alloy layer. The ceramic is very hard, and provides strong abrasion resistance and high impact resistance. Due to its chemical charge, EonCoat is actually pulled down into the valleys of the substrate profile. Unlike traditional coatings that sit atop the profile with coverage gaps in the valleys where corrosion begins, EonCoat covers the entire substrate. There are no gaps. An amorphous alloy layer of iron phosphate forms. This contiguous phosphate layer is created through a chemical reaction with the steel–the EonCoat and the steel share ions and the EonCoat chemically becomes part of the steel. There are no coverage gaps. And there is no way for corrosion to get ‘underneath’ this stable covalent bond. The molecular bonds form through the sharing of electron pairs between the atoms in EonCoat and the atoms in the steel. Traditional barrier coatings fail because they sit like a tarp over the steel, and once the tarp is torn and moisture enters, the steel corrodes. By definition, barrier coatings always fail, because once a barrier coating is compromised corrosion spreads like a cancer. EonCoat is not a barrier coating. EonCoat is self-healing. First, the coating forms a magnesium iron phosphate alloy layer with the steel. Then a ceramic topcoat forms over the alloy layer. The ceramic functions as a phosphate reservoir to continuously protect the alloy. If the ceramic is scratched or chipped it has no effect on the corrosion protection of the alloy. So the steel is still protected. And even if someone cuts a scribe line through the ceramic and through the magnesium iron phosphate alloy, the ceramic layer will leech phosphate to re-alloy the steel. No barrier coating in the world provides this self-healing ability to re-alloy steel.